Traditional Japanese osechi ready to be eaten in the New Year. Image from Flickr user Taichiro Ueki . While Japan may have embraced Christmas in its own unique way , Shogatsu (正月  Japanese New Year) is more significant in Japan, with many people quietly celebrating at home with their families. Osechi Ryōri or osechi describes a collection of traditional foods developed during the Heian Period  (794-1185) which is eaten during the holiday. 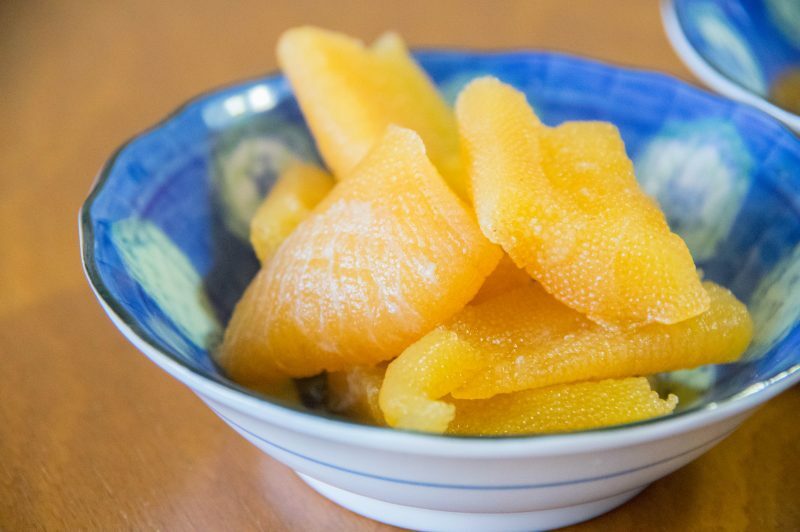 The history and the meaning behind this culinary tradition are a unique aspect of the Japanese New Year celebration. Osechi is prepared in advance during the days leading up to the New Year and is supposed to be brought out and served later. There are two main reasons for this, the first being that it was considered taboo to use fire to cook meals for the first three days of the New Year, except for preparing ozōni (お雑煮), a traditional soup containing mochi (餅, pounded rice cakes). The second reason is that, because shops were traditionally closed during the New Year, families (more precisely, the women who traditionally cook family meals in Japan ) needed enough food to last them through the holidays. 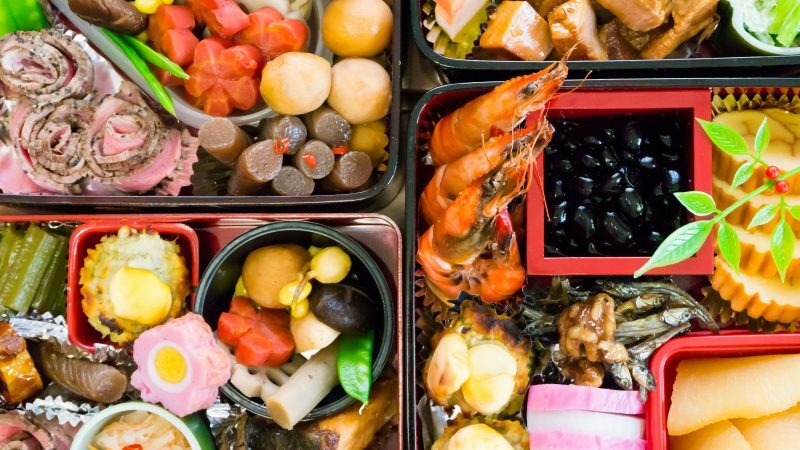 Traditional osechi dishes could be stored for several days without refrigeration. Preparing food in advance also meant that the women could take a break with the rest of the family. Ozōni, or zōni, a soup containing mochi rice cakes. Image from Flickr user msya3 . Osechi foods typically have a symbolic meaning. For example, on New Year’s Eve, a dish called toshikoshi soba (年越し蕎麦), or “year-crossing buckwheat noodles”, are eaten to bring good luck in the coming year. The noodles symbolize vitality, health, and long-life. They are also practical because traditional wives who were busy cooking several days’ worth of food for everyone would prefer to make something quick and easy to eat right away. 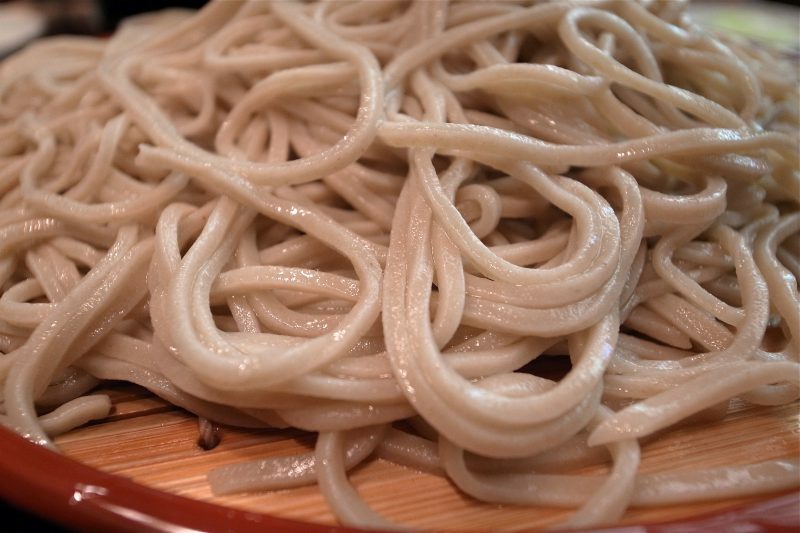 Soba is said to signify strength and resiliency due to the hardiness of the buckwheat plant, while the long, thin shape of the noodles denotes the wish for a long life. Image from Flickr user Naotake Murayama . 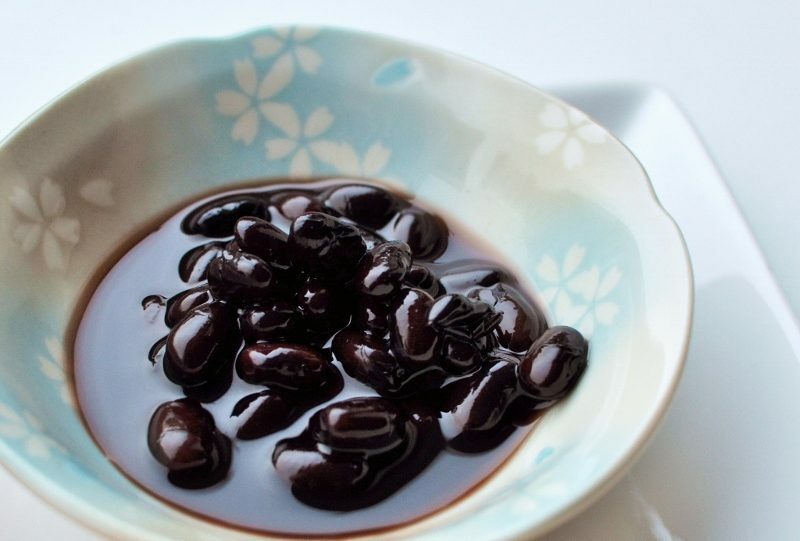 Kuromame, or black beans. Image from Flickr user Malicamera . Eating this dish means you will be able to work hard (マメに働く, mame ni hataraku) in the New Year. Being able to work hard is a very good thing in Japan, although it's often reported that people work so hard that they work themselves to death . 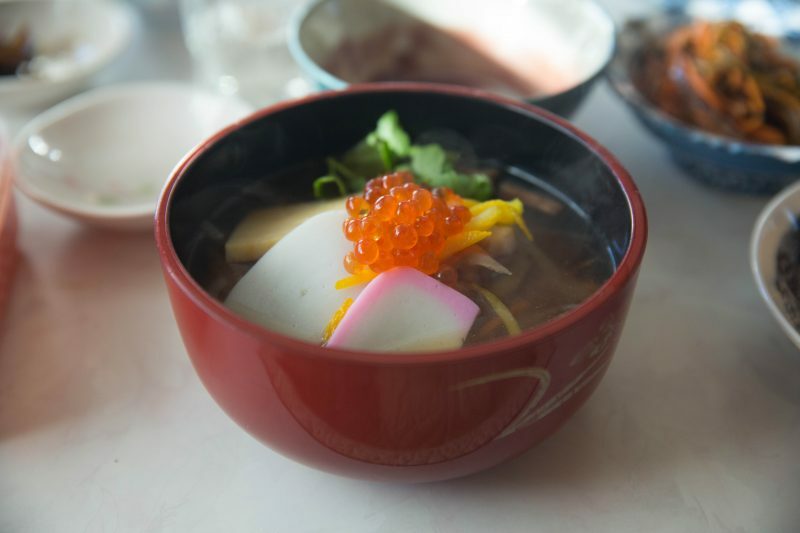 Herring roe, known as kazunoko in Japanese. Image from Flickr user sakaki0214 . People eat these to be blessed with many children, as herring generally produce a lot of eggs. Nishin, Japanese for ‘herring’, can also mean ‘two parents’. 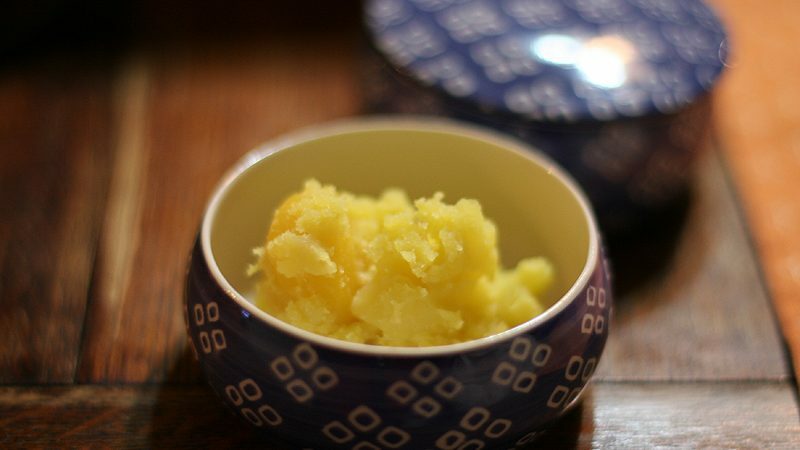 Kuri kinton, candied chestnuts in sweet potato mash. Image from Flickr user koizumi . The bright yellow-gold of kuri kinton connotes wealth. Yellowtail teriyaki. Yellowtail is so good at this time of year! My daughter's meal requests include yellowtail teriyaki, fried chicken, shrimp and egg stir fry, chicken rice… The list goes on. Let's find some time to make them! I've been off on a long business trip and eating out all the time, so it's good to eat home cooked food! Eating yellowtail (also known in English as Japanese amberjack, or Seriola quinqueradiata ) over the New Year's holiday is thought to bring luck if you're hoping for a promotion at work. This is because, in Japanese, yellowtail is known as “the fish that gets a promotion” (出世魚, shusse uo). The yellowtail fish is actually called different names in Japanese over time as it grows. Depending on the region of Japan , a very young yellowtail is called tsubasu (ツバス). As it grows it might be called hamachi (ハマチ), and then fukuragi (フクラギ). This dish is through to be lucky because it rhymes with medetai (めでたい, congratulatory). Tai is also commonly eaten for other “medetai” occasions such as weddings. Hana renkon for a clear view of a bright future, blossoming like a flower. When cooked with watermelon radish, it'll turn a lovely shade of pink. This root is full of holes and it is thought that, when looking through these holes, one has a chance to glimpse at the future. This dish is made from hard-boiled eggs whose yolks and whites are separately strained and steamed. The bright yellow egg yolk symbolizes gold and the egg white represents silver. Nishiki, a mixture of silver and gold, is a word used to describe fame and glory. A plateful of prawns. Image from Flickr user nolabwork . 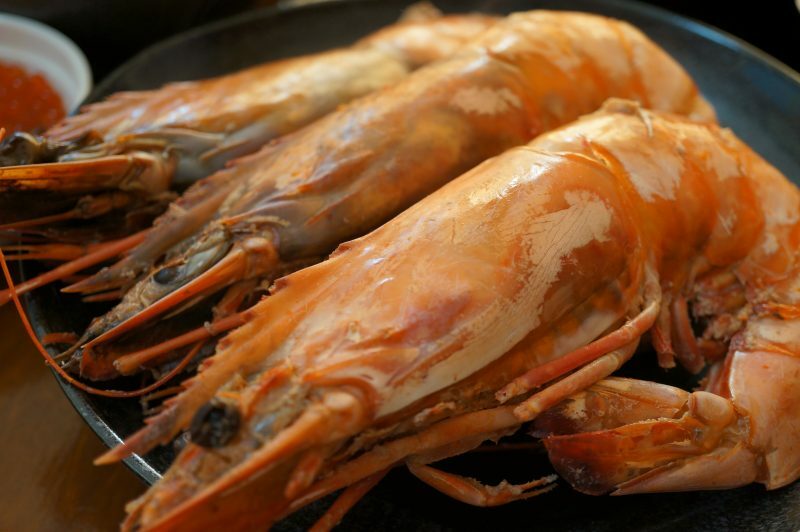 With their hoary whiskers and hunched back, prawns have earned the Chinese characters “the old man of the sea”. Eat shrimp and live a long life. Red and white, or kohaku, are considered opposite colors in Japan; when these words are joined together as a word, kohaku means “peace and safety”. Everyone watches the annual Kohaku singing competition on New Year's Eve. Kobumaki is an essential part of Japanese cuisine. Because it rhymes with yorokobu (喜ぶ, be happy), it represents the wish for a long, healthy, happy life. Also used as a New Year's decoration, kelp brings good luck to the home! Today, many families rely on store-bought osechi ryōri provided by supermarkets and convenience stores. Prices range from ¥10,000 (or about $90 USD) for the cheapest sets to ¥100,000 (or about $900 USD) and upwards for the more high-end options. Perhaps because of the hassle of cooking so many different dishes, the practice of cooking one's own osechi is on the decline and a recent survey by NHK  found that more and more Japanese people are skipping it all together. According to a survey of 7,000 people aged 20-69 conducted by food manufacturer Kibun Foods, just 54% of respondents had osechi at home, whether homemade or bought, with 46% opting not to serve the traditional meal. It's not so much a question of making or buying—many families are not serving osechi at home at all. These numbers were even higher for respondents in their 30s, with 57% of this group not having osechi. Even more surprisingly, when asked if they had ever eaten osechi before, 11% of all respondents, and 20% of those in their 20s, said that they had never eaten osechi in their lives. This raises some concern about the future of Japan's traditional culture. In fact, many Japanese don't particularly like osechi. So come on Japan, let's come up with a new New Year's food culture! I'm always saying how much I like sushi, I love meat too and eat it a lot, I love fish whether boiled or baked, I love salad and stir fries. The only food I can think of that I don't like is the black beans in osechi. I love osechi so much, it's become a yearly tradition for me to eat osechi while watching Hakone Ekiden and Gaki no Tsukai recordings and other New Year's programs. I love datemaki (伊達巻, rolled omelet with fish paste) the most! If you're ever invited to spend New Years in a Japanese home, you can impress your hosts with your knowledge of the meanings of the various osechi dishes!